The schoolhouse is oriented with the gable end facing the street typical of a Greek Revival style building. On the exterior it contains a pointed peak vent and splayed brick lintels. 1 National Register of Historic Places nomination form. "Battery Street Historic District." Burlington, Vermont. 1976. 2 Blow, David. 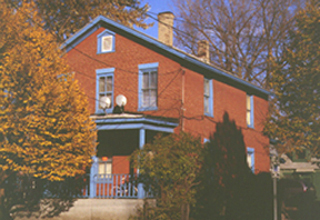 Historic Guide to Burlington Neighborhoods. Chittenden Co. Historical Society: Burlington, VT. P. 101.